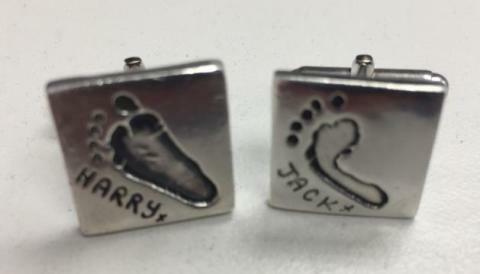 This picture shows a pair of cufflinks that carry great sentimental value for their owner. Sadly, they were stolen during a burglary in Bosville, Eastleigh. We would like to recover them and return them to their rightful owner, so we are asking the public’s help for any information regarding their whereabouts. Have you been offered sale of these cufflinks in suspicious circumstances, or seen them online? Do you run a pawn shop and had someone bring these in? In addition, we would also like to hear from anyone who has information relating to the burglary itself. The incident took place some time between 6.40pm on Monday 10 September and 6.20pm on Tuesday 11 September. Along with the cufflinks, various items of jewellery including bracelets, earrings and necklaces were stolen, as well as watches, a laptop and power tools. One of the power tools is described as a BOSCH SDS 24 volt cordless hammer drill. It was contained within a heavy and bulky petroleum blue plastic case with the letters ‘C WATT’ on the outside. If you have any information, please contact us on 101, quoting 44180343415, or call the charity Crimestoppers anonymously on 0800 555 111.